The historic hotel is helping guests get into the wayback groove of '67. The bucolic historic hotel is helping guests get into the wayback groove of '67, complete with a trip to the Haight and de Young Museum. SUMMER OF LOVE PACKAGE... includes accommodations in either a Contemporary or Historic Room, and round-trip transportation to both the Haight (where a self-guided tour, voiced by none other than Peter Coyote, will lead you by some major sites o' '67) and the de Young Museum, which is featuring an exhibit called "The Summer of Love Experience: Art, Fashion, and Rock & Roll" through Aug. 20, 2017. Also provided for your trip into the city? A picnic lunch, to keep your energy up for all of that summery soaking-in. 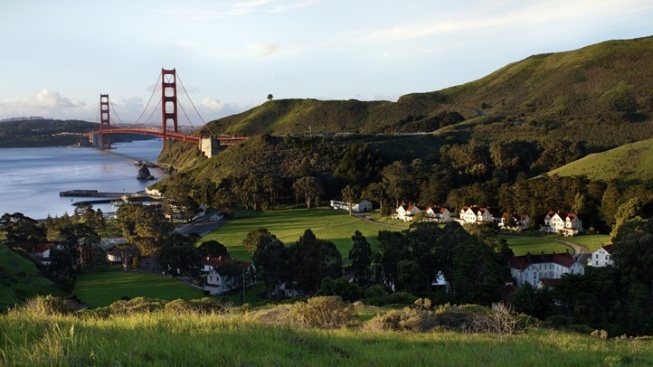 And if you're staying on a Sunday, Cavallo Point is providing a ride to Stern Grove, the sound-sweet staple now in its 80th year. The hotel also has a playlist to download full of hits of the era, including Jefferson Airplane, Janis Joplin, and more greats. For prices, details, asterisks, and all of the vibes you'll need to grok to before finding your path back to a summer in the past, start here, flower people and lovers of this journey of life.